I’m sure my readers are well aware of the Occupy movement, which started in New York and has since spread across the globe. In case you’re unaware of what the Occupy movement is about here is a brief description taken from the Occupy Wall Street website. 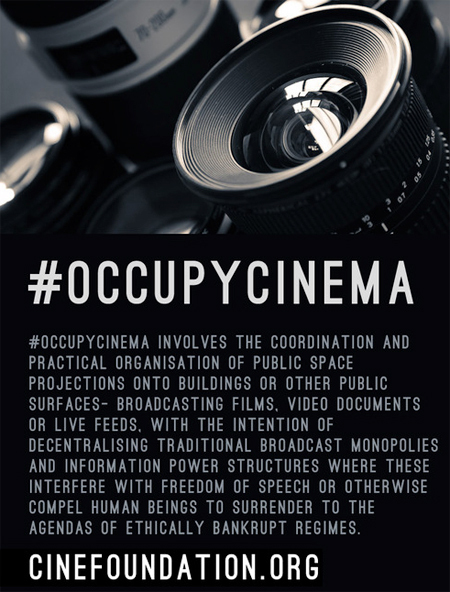 In response to the worldwide Occupy movement I wanted to share some Occupy Cinema (Twitter hashtag #occupycinema) links with my readers that may offer a way for cinema lovers to take part in and support the movement. The ideas shared by the following sites might also inspire you to explore ways that you can use cinema as a positive activism tool in your own life. From the Occupy Cinema website: “An open collective harnessing the moving image to aid the worldwide occupation movement.” Occupy Cinema was recently featured in IndieWire where they discussed their goals and objectives. Please approach all of these sites with some caution and common sense. It’s up to each individual to figure out if and how they might participate in the Occupy movement and what level of commitment and support they’re able to offer.